8 teams are left and in two weeks from now one of them will be crowned Football’s new World Champion (or soccer if you will). 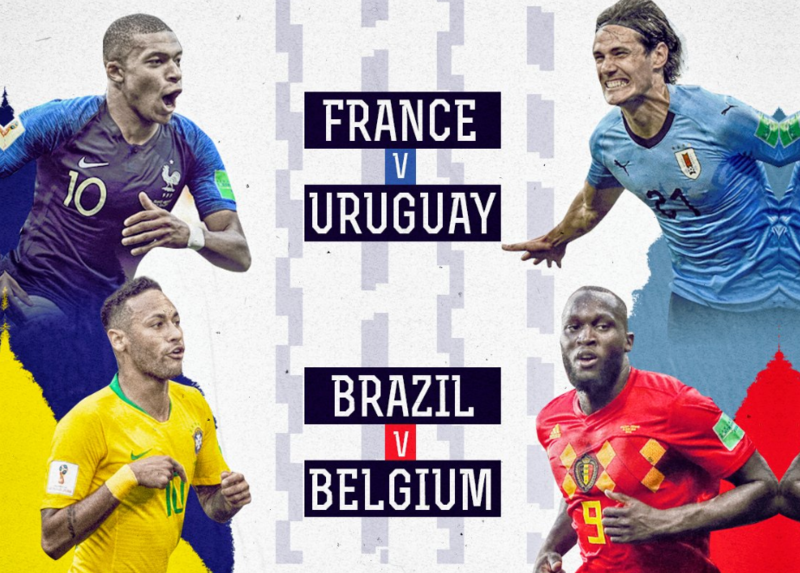 Let’s break down how the quarter-finals line up today as the ‘better’ half of the tournament side meets in two thrilling games. Uruguay may be one of the smallest nations still participating at this stage of the tournament, given that they’ve won it twice already they are always a force to be reckoned with. In today’s first quarter-final Uruguay, take on former (1998) champions France, in the Nizhny Novograd Stadium, as both sides seek to secure their place in the semi-finals. Uruguay has won all their matches so far and only allowed one goal against them. It looks like they will miss out on the services of Edinson Cavani, their PSG striker, which would be quite the setback against France. France did not impress that much during the group games. An unimpressive but controlling 2-1 win over Australia’s ‘Socceroos’ was followed by a 1-0 against South American side Peru. In the last match of the group stages, the French knew that a draw would secure them on to the next round and thus a 0-0 result was logical, but once again very boring outcome against Denmark. In the first group of the knock out stages, the true French team was shown in a whirlwind performance against Argentina which finished 4-3 and was hailed as one of the best games of the tournament so far. It is an equally matched game today with France a slight favorite to go through. Hailed as a must-see, the Belgian ‘golden generation’ meets up with the probable tournament winner Brazil (if pundits are to be believed). The Belgians will be the first team that will not play to draw or hope for penalties against the South American behemoth but will face them head on with 3 attackers. Neymar and Coutinho know that the playmaking abilities of Hazard and De Bruyne will cause them problems but they are hoping that the return of their defensive rock Marcelo will secure a win. Many analysts predict this to become a ‘classic game’ but Brazil to go through in the end.